Designers, Pam Soliday (left) and Janet Nesbitt (right), are sisters who were raised on a wheat farm just down the road from their quilt shop, The Buggy Barn, which they opened in 1996. Because the shop is located in the heart of Washington’s wheat country, 22 miles west of Spokane, WA, the sisters developed their trademark crazy quilt patterns in an effort to draw customers out to the shop. 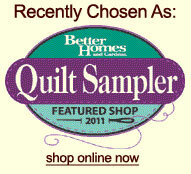 Their crazy method employs quick cutting, easy piecing, lots of fun, square it all up, and you are done! 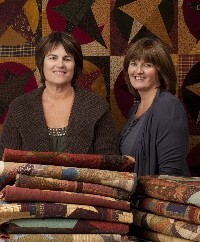 Pam & Janet are avid scrap quilters who love to mix prints and plaids and are known for their unique sense of color. Thanks to Henry Glass & Co, you, too, can now achieve the unique Buggy Barn look with fabrics designed by Pam and Janet exclusively for quilt shops! We had an awesome time getting to know these two ladies in April 2012. Please let us know if you have an interest in a retreat by these two. 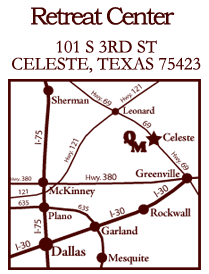 We hope to schedule them again in 2015.